Newry, Mourne and Down County has appointed an Age Friendly co-ordinator who has been driving the Age Friendly agenda both internally and externally across the district. We have already put in place a number of Age Friendly actions such as the establishment of our Age Friendly Strategic Alliance, which has been in existence since 2013. 4) To advise other areas in demonstrating the processes and benefits involved in the development and promotion of age friendliness. In addition to the Alliance, we have also formed an older people’s forums. The forum consists of people aged 50+ who also represent the District geographically. The forums meet once a month to discuss issues which are prevalent in the community in which they live. The Strategic Alliance partners are those with a key role and responsibility for addressing issues relating to older people who live in the NMDDC area. 2 significant developments that happened in the area as a direct result of the Strategic Alliance was the recruitment and management of an Older People’s Forum in 2 parts of the district. 1 of these is specific to the Newry and Mourne section of the district and 1 is the Down part of the district. These forums are led by older people. The membership is both demographically and geographically equal. They are now working of their own action plan and this is presented to the Strategic Alliance twice a year. The Chairperson from the Older People’s Forum also represents the forum members on the Strategic Alliance and cascades information back and forward between both branches. The district also has an Age Friendly Coordinator as mentioned above. They offer advisory and administration support to the Forum Chairperson. 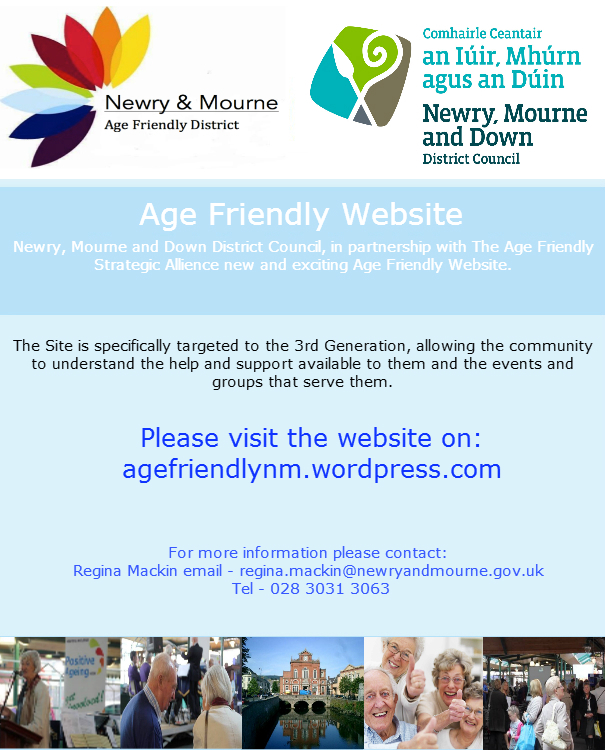 The Age Friendly Coordinator is also the link between NMDDC and SHSCT Community Development teams with a responsibility to deliver actions against older population groups/individuals.